It looks like what has been feared since the spring has actually happened. Echoing the trigger that led to Indira Gandhi's imposition of emergency in India more than thirty years ago, reports are emphasizing that President Gen. Pervez Musharraf's imposition of a state of "emergency plus" in Pakistan has come on the eve of the Pakistan Supreme Court's decision concerning his eligibility to be elected as President. But the Court has been active in other ways this week that have undoubtedly made Musharraf uncomfortable, most notably its strong signal that it regarded former Prime Minister Nawaz Sharif's rendition to Saudi Arabia to be unlawful and possibly in contempt of its earlier order permitting his return. "[W]e would like to emphasise that the judgment passed in Nawaz Sharif's case is still holding the field and required to be implemented in letter and spirit," noted Chief Justice Iftikhar Muhammad Chaudhry, and the Court's decision in that case was expected this coming week as well. "The Chief of the Army Staff (General Musharraf) has proclaimed state of emergency and issued provisional constitutional order," the brief announcement said at 6.10 pm Pakistan time without giving any details. Under the order, the constitution remains suspended, the federal cabinet ceases to exist and judges will have to take oath afresh. The imposition of a "provisional constitutional order," to which judges must then newly swear allegiance to remain in office, is an old Pakistan Army magic trick, one that in the past has served as step one in a process that has helped conjure up the illusion, at least superficially, that some measure of constitutional normalcy remains even as the army in practice nullifies the constitution and imposes martial law. In the past, this process has led to the removal of judges who have refused to affirm their loyalty to the new provisional order and, ultimately, to legal validation of military rule itself. Musharraf himself issued a provisional constitutional order after his 1999 coup, and following the purge of five Supreme Court justices who refused to swear their allegiance to him, the Court greenlighted his coup. (UPDATE: the Court's order, which was issued by a bench of seven justices before the Army could put the judiciary on ice, is available here.) Earlier this week, one justice stated in open court that the Court would not be cowed by the threat of emergency. "'No threat will have any effect on this Bench, whether it is martial law or [state of] emergency,' said judge Javed Iqbal. 'Whatever will happen, it will be according to the Constitution and rules ... No group should think that it can take the Supreme Court hostage.'" [link] As rumors swirled this week that an emergency declaration might be imminent, newly-elected Supreme Court Bar Association President Aitzaz Ahsan -- who reportedly has been arrested -- made clear that the Pakistani legal community would resist any such move. If early reports are to be believed, it seems that the justices may indeed be exhibiting such courage in the face of Rangers storming the Supreme Court building. No word as yet on whether they are welcoming these events in Washington as "not necessarily the worst thing that could happen." Whatever tepid and disingenuous objections the Bush Administration might now offer to what its pal Musharraf is doing, there seems little doubt that Pakistan has now been left to reap what the Bush Administration has helped to sow. Is the internal Taliban / Al Qaeda threat real? Or is it simply a pretext to assume power and derail the courts? Thirdly, this has incredible consequences for Afghanistan and Pakistan. Nobody talks about this. Do 75 of our colleagues not understand? We have now driven underground every moderate in Pakistan and in Afghanistan. This literally -- literally -- puts Karzai, as well as Musharraf, in jeopardy. This would also mean that on some level, Pakistan is reaping it's own work -- having pumped a tremendous amount of funding into Taliban power circles a few years back. Now of course, Pakistan is battling pro-Taliban and Al Qaeda forces in Swat, etc. If the answer is that it's just a power grab, that raises all the questions already posed about our closeness with such an anti-democratic regime. This would also mean that on some level, Pakistan is reaping it's own work -- having pumped a tremendous amount of funding into Taliban power circles a few years back. To a considerable extent, of course, at the instigation of the United States and with U.S. funding. And this year, the Bush Administration's support for Musharraf has been unwavering -- even as he's edged closer to this moment with countless smaller, intermediate steps that the Administration has, at a minimum, implicitly condoned. It's a bit ridiculous for them to object now given that they should have been speaking up much earlier, when it actually might have made a difference. Instead, they stood silently by their man. As unfortunately ends up being the case all too often, I'm not sure I understand what Biden is talking about in the passage you've quoted. I think that's my mistake -- 15 yards for clipping. Below is the full exchange. I think he was basically saying that the Iran resolution only makes things worse. Further, senators (who passed the anti-Iran resolution) and other leaders aren't watching Pakistan and Afghanistan. MR. RUSSERT: MR. RUSSERT: We're going to get to Social Security in a little bit, but I want to stay on Iran, Senator Clinton. As you know, you voted for the Kyl-Lieberman amendment, the only member on the stage here who did that. Senator, Jim Webb of Virginia said it is for all practical purposes mandating the military option, that it is a clearly worded sense of Congress that could be interpreted as a declaration of war. Why did you vote for that amendment, which would -- calls upon the president to structure our military forces in Iraq with regard to the capability of Iran? Senator Biden, do you agree with Senator Webb it was de facto a declaration of war? SEN. BIDEN: I think it can be used as a fact -- a declaration. But look, we have a -- we have a problem in the Senate -- and I'm not just directing this at Hillary; all -- there were 75 other people who voted with her, we're in a minority -- that there are consequences for what we do. And it's not even about going to war. Let's look at what happened from the moment that vote took place. Oil prices went up to $90 a barrel. Who benefits from that? All this talk of war, all this talk of declaring people to be terrorists, drove up the price of oil. Secondly, we have emboldened Bush at a minimum. His talk of World War III, totally irresponsible talk. We've emboldened him, Tim, to be able to move if he chooses to move. They're terrorists. The fact that they're terrorists on one side of the border or the other, we've just declared them terrorists. That gives him the color of right to move against them. The notion here is it plays into this whole urban legend that America is on a crusade against Islam. This was bad -- if nothing else happens, not another single thing, this was bad policy. The president had the ability to do everything that that amendment, that resolution called for without us talking to it. And all it has done is hurt us, even if not another single action is taken. Actions have consequences. Big nations can't bluff. MR. RUSSERT: Senator Biden, would you pledge to the American people that Iran would not build a nuclear bomb on your watch? SEN. BIDEN: I would pledge to keep us safe. If you told me, Tim -- and this is not -- this is complicated stuff. We talk about this in isolation. The fact of the matter is the Iranians may get 2.6 kilograms of highly enriched uranium; the Pakistanis have hundreds, thousands of kilograms of highly enriched uranium. If by attacking Iran to stop them from getting 2.6 kilograms of highly enriched uranium, the government in Pakistan falls, who has missiles already deployed, with nuclear weapons on them, that can already reach Israel, already reach India, then that's a bad bargain. Presidents make wise decisions informed not by a vacuum in which they operate, by the situation they find themselves in the world. I will do all in my power to stop Iran from getting nuclear weapons, but I will never take my eye off the ball. What is the greatest threat to the United States of America: 2.6 kilograms of highly enriched uranium in Tehran or an out of control Pakistan? It's not close. I have another question. In reading the coverage today, I saw a blurb about how Musharraf's fate will play out "on the streets" -- i.e., the army is sensitive to public sentiment and might decide to remove him if the martial law declaration lacks widespread support. 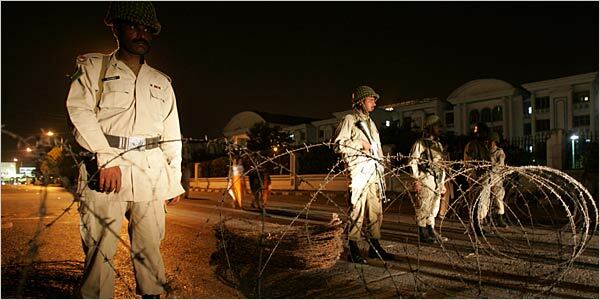 Does the Pakistani military primarily and typically look to protect itself as an institution? Or is it more an organ of loyalty toward individual leaders? I'm not really in a position to begin parsing the Pakistani Constitution, so could some one who knows what they're talking about give a brief explanation of what the legal meaning and justifications are for holding the constitution "in abeyance"? From what I gather, the Pakistani constitution has been in some sort of limbo for at least 8 years, but I'm trying to understand whether this emergency is something constitutional, extraconstitutional, or something else. And after I have I response, I will probably offer a cynical and snarky comment about the US Office of Legal Counsel, the Justice Department and the President's counsel. but I'm trying to understand whether this emergency is something constitutional, extraconstitutional, or something else. I'm certainly no expert, but I've read in several places that specifically because the constitution does NOT allow for the type of action taken, Pakistan is considered to be under martial law by legal experts, not anything softer like a viable "emergency order." I take that to mean that the action itself violates the constitution. It's an extraconstitutional move to hold the Constitution in abeyance but to permit it to function to some extent -- maybe crudely akin to saying that we'll ignore the Geneva Convention but roughly adhere to it. Without getting into the details, and at risk of oversimplifying quite a bit, the means by which this kind of extralegal move typically have been given legal effect in Pakistan has been by manipulating/intimidating the Supreme Court into validating the extraconstitutional step as justified by necessity. One significant means by which that has taken place in the past has been by requiring judges to take a new oath of allegiance to the new extraconstitutional regime itself -- precisely what Musharraf's "provisional constitutional order" requires. In the past, judges have been all too willing to validate the coup under the doctrine of necessity, and voila! the coup gets legitimized. This is why Tayyab Mahmud calls all of this a "jurisprudence of successful treason," which I might have mentioned in one of my earlier posts. What's unprecedented in Pakistani history about the events of this week is that so many judges have refused to take the new oath, and that a bench of the Supreme Court actually invalidated the emergency proclamation and PCO altogether, rather than agreeing on Musharraf's terms to justify the coup under the doctrine of necessity. I suppose Musharraf and his cronies would be able to find enough judges willing to play ball soon enough -- after all, they've got the tanks *and* the Bush administration firmly on their side -- but already it seems that it won't be anywhere near as smooth sailing to get there as it has been in the past. Good, that's I thought, and therefore here is my snarky comment. I would like to see the OLC or White House counsel's memo on whether the President of this country could do the same thing here. Indeed, regardless of whether there is such a memo, I'd like to know if the question was even asked (I've got my guesses as to who'd be doing the asking) and thought about. "Is the internal Taliban / Al Qaeda threat real? Or is it simply a pretext to assume power and derail the courts?" Looks like the link got cut off. So the post's title is "Eating Out of Musharraf's Hand." TheWorld of Kung fu Gold seems also important. His only since ancient immutable law. WoKf gold in the game is just like the money in the life. It is different of the buy World of Kung fu Gold online in the game world. You can have cheap World of Kung fu Gold to update your weapons. And the World of Kung fu money should be more and more.